Above, the W.B. Hurlow as we acquired. As is. Above, how the new owner set the bicycle up. The new owner adds- "Only a custom, chrome rear rack needs to be added. 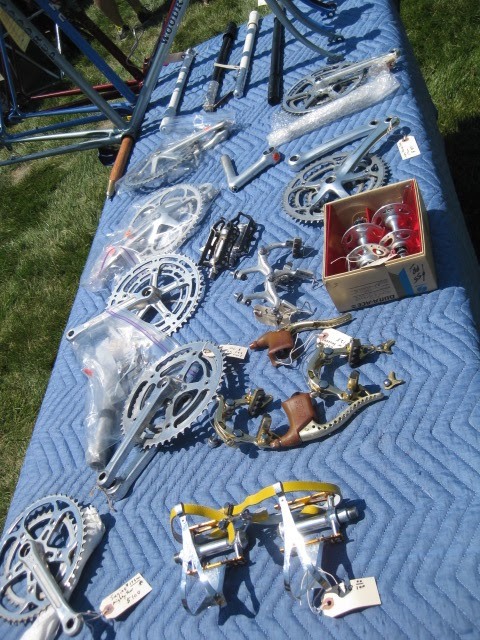 Wheelset, freewheel, cable housing, cables, chain, alloy fenders, pedals, and rear derailleur have been replaced with suitable components." 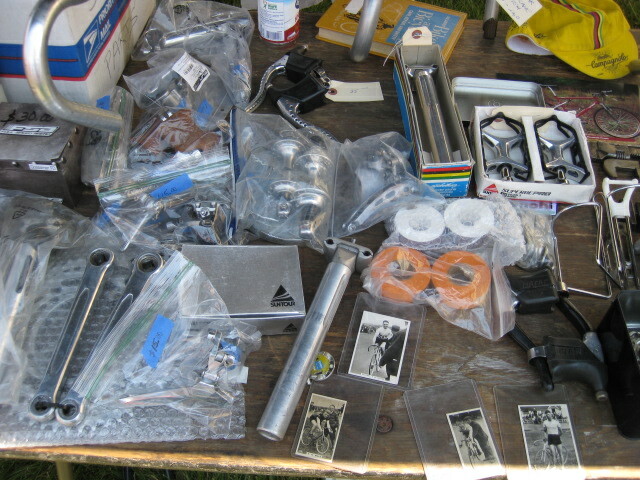 Items seen for sale at Cirque Swap meet. 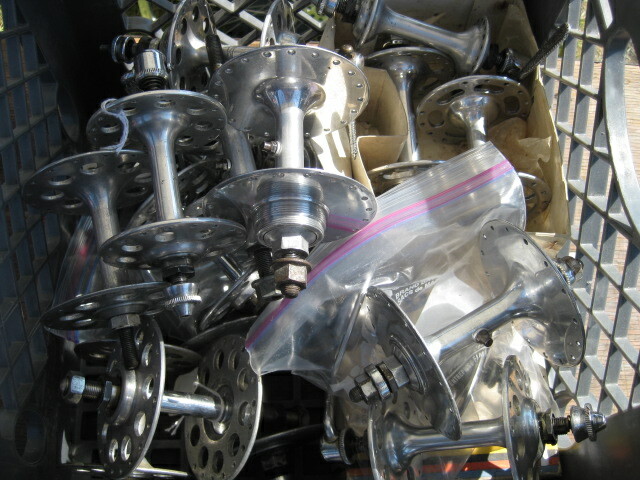 I've said it before, go to swap meets- buy and sell and trade. 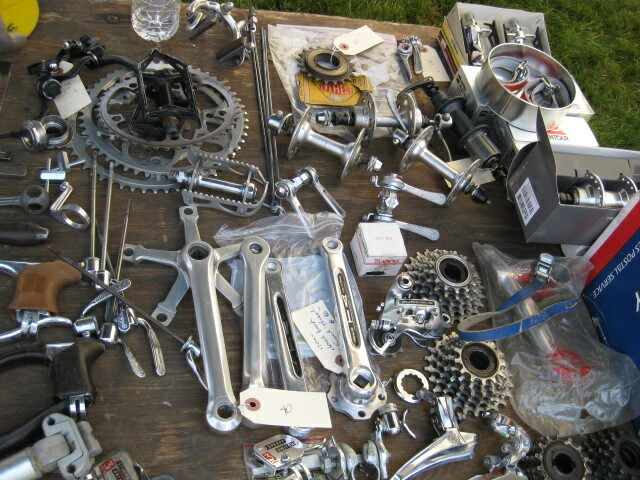 A load of new old stock items- vintage Campagnolo and Dura Ace. 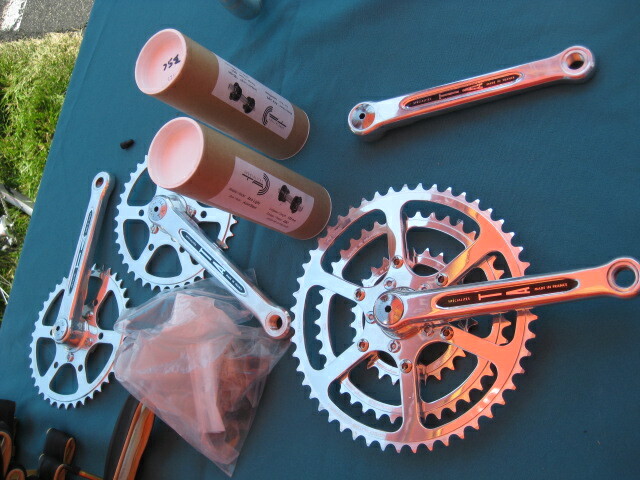 NOS TA tandem crankset with bottom brackets. 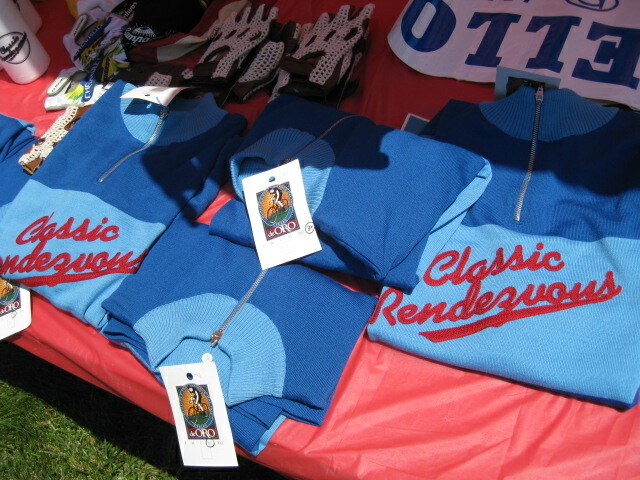 Classic Rendezvous wool jerseys. Ok, I bought one for myself! Campagnolo C-Record high flange hubs. These hubs have 7 windows. Seat cluster with internal lugs. Internal brake cable routing. 1983 Moretti road bike owned by Peter Gilbert.. Little touches like the stripes on the hubs and in the headset spacers make bikes like this a treat to look at in a show like Cirque. 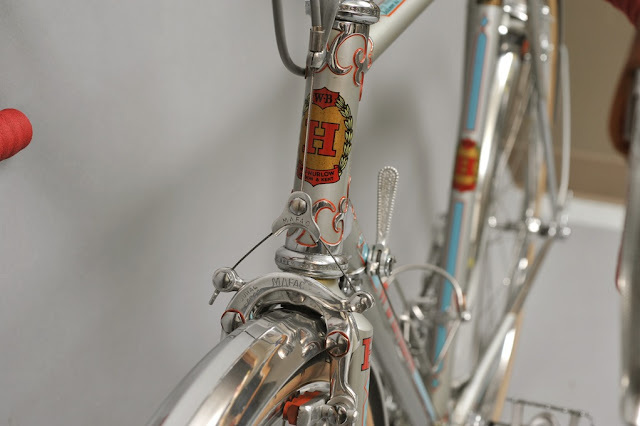 Named after Caesar Moretti- a six day bike racer from the 1930s-1950s, some were imported Bertins and others were supposedly built in Italy. This light blue bike was built by Eric Parker. 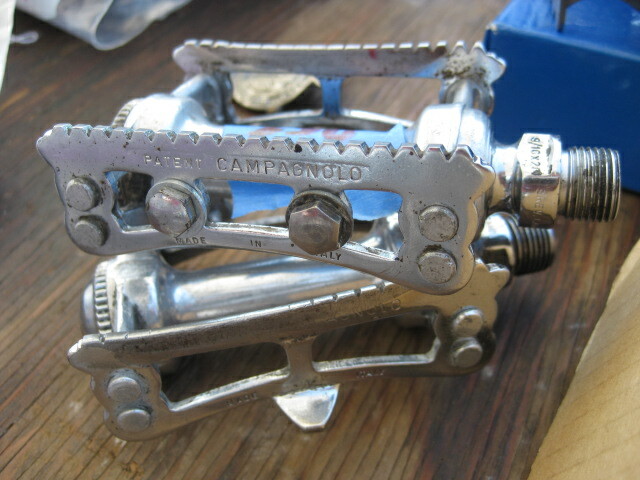 Campagnolo Cobalto brakes and WCS stripes on the brake levers. well not exactly for vintage bicycle riding, but it makes for a good way to show routes and possibly find riding friends. my ride on Sunday was more about finding hills and doing some of climbs over(maybe even getting a little lost). When looking at a ride on Strava, their are segments that you can use to gauge how your ride is going. I have a usual route I ride to get out of Philadelphia, and do some of the same climbs every week, and it is nice to see myself getting stronger as the season progresses and set new personal records on them. It is minor, but these little achievements help make riding solo a little more challenging and helps one push themselves. You can follow riders so you can learn new routes and in my case, hill climbs that are new to me. Larry Black owns this Hi-E road bike that was on display at Cirque. 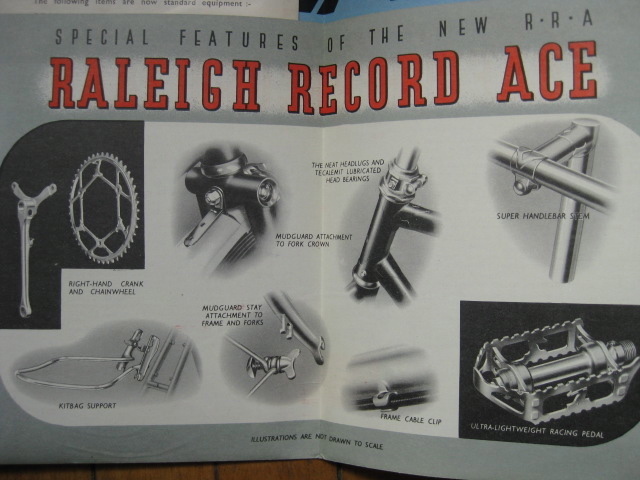 It is an amazing display of innovation in lightweight technology, and a forerunner to modern lightweight bicycles. Harlan Meyer built this bike. HERE is Classic Rendezvous's webpage on HI-E.
Dropouts joined to the frame. The rear hub is Hi-E as well. 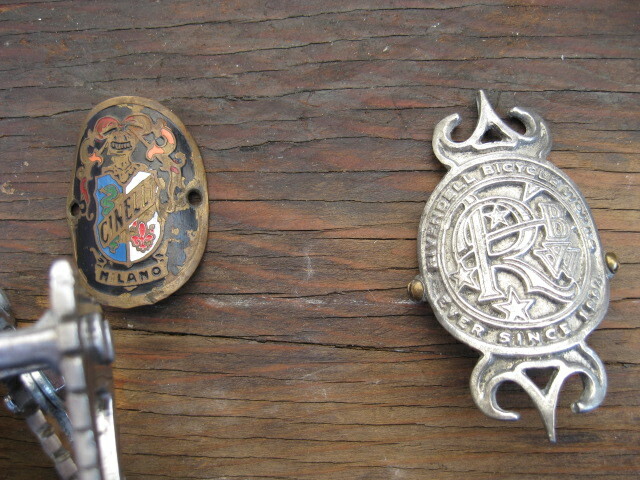 Drillium on rear derailleur- (stock Huret 3rd Generation Jubilee rear derialleur). This shot also shows a side angle of the rear dropout joining the seat- and chain-stays. It's also interesting how the rear derailleur housing runs inside of the dropout. 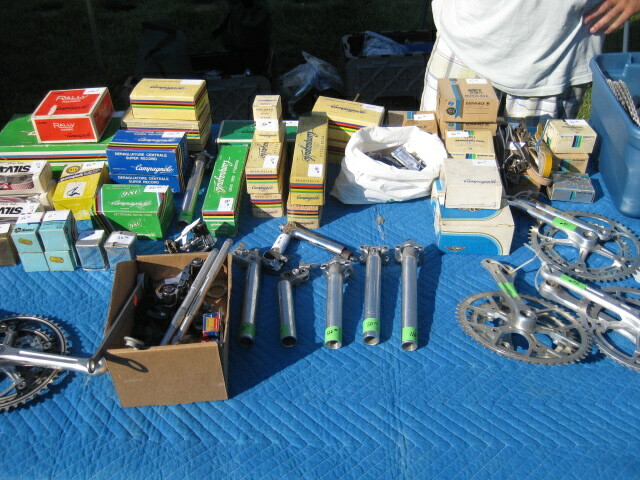 There were many great J.P. Weigle bikes at Cirque. I overheard one person say that "there should be an award for best Weigle" during the award ceremony. There were so many that it was hard to choose one favorite. This post will highlight some of his bikes and their unique and beautiful features. Custom front rack nicely mounted to Paul new racers. Sorry for the out-of-focus shot, its the best that I have of this entire bike. Another integrated taillight with a interesting cable hanger and Mafac Competitions. A wider shot of the rack and lights that I posted before. My name is Aaron Popelka, and I am a mechanic at Via Bicycle. I will periodically be making guest posts on this blog to supplement Joel's regular posts. This past weekend I accompanied the Via team to Cirque for the Sunday show and swap meet. I took many more photos, and will be posting more detailed photos and descriptions of bikes in the coming days, but here is a sampling of some of the bikes that were there that were particularly interesting or beautiful. Super clean Mario Confente track bike in the hotel lobby, owned by Wayne Bingham, organizer of Cirque. I wish I could get a drive side shot, but the couch was in the way. 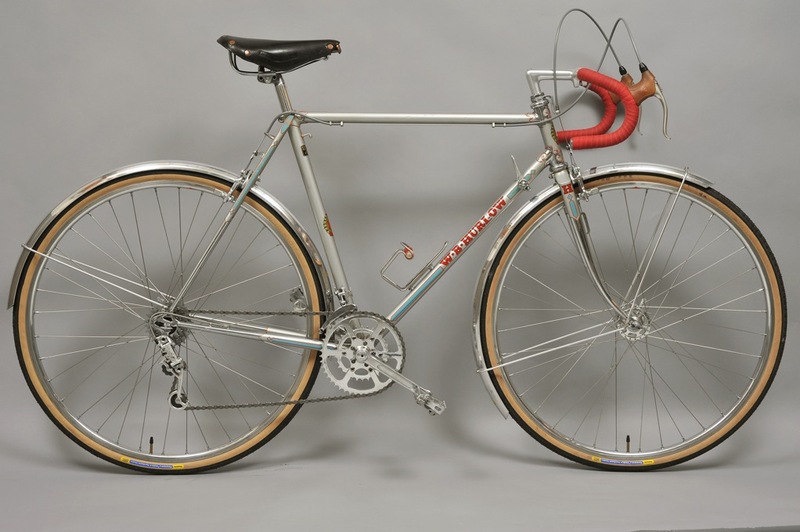 An early Hi-E lightweight road bike owned by Larry Black. Dual headlights and a nice rack on a J.P. Weigle.